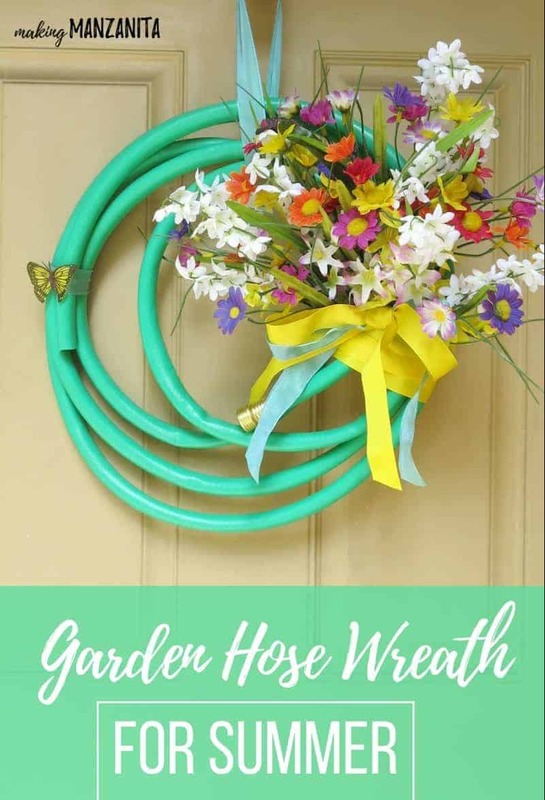 This bright and colorful Summer wreath made with a garden hose is the perfect addition to your front door during the Summer season! And you’ll be shocked how easy it is to recreate this summer wreath. Are you guys ready for summer?! I sure am! My front door was in need of some color to go along with my bright and cheerful Hello Sunshine wood sign I made last week. 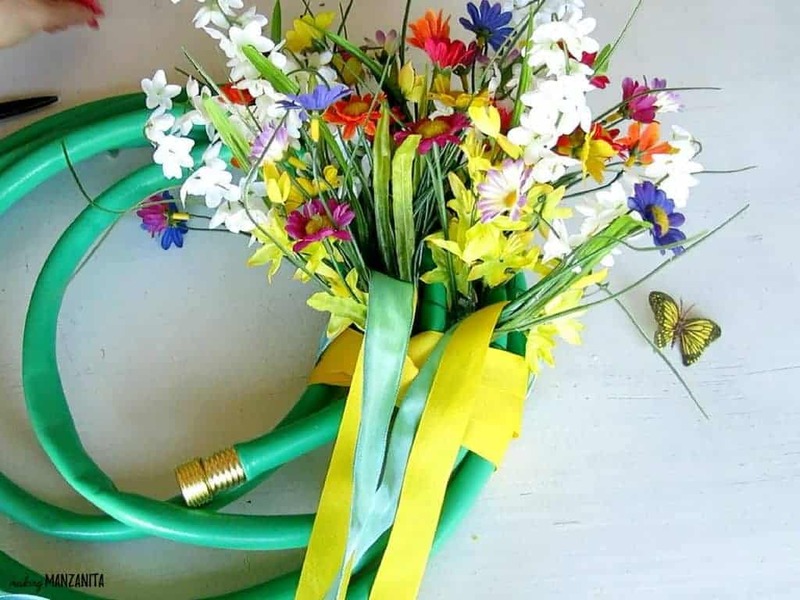 When I started thinking about what I wanted for a summer wreath, I knew that I wanted something colorful, creative and cheerful (I swear I didn’t plan that alliteration!). When we were wondering about the outdoor section at our local Habitat for Humanity ReStore, I spotted a bunch of old garden hose wreaths and VOILA! 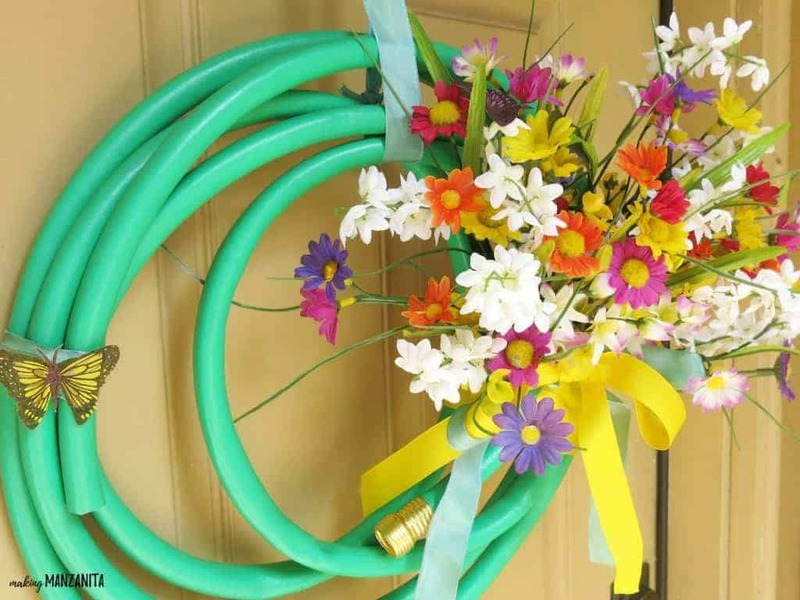 My summer wreath made with a garden hose was born. 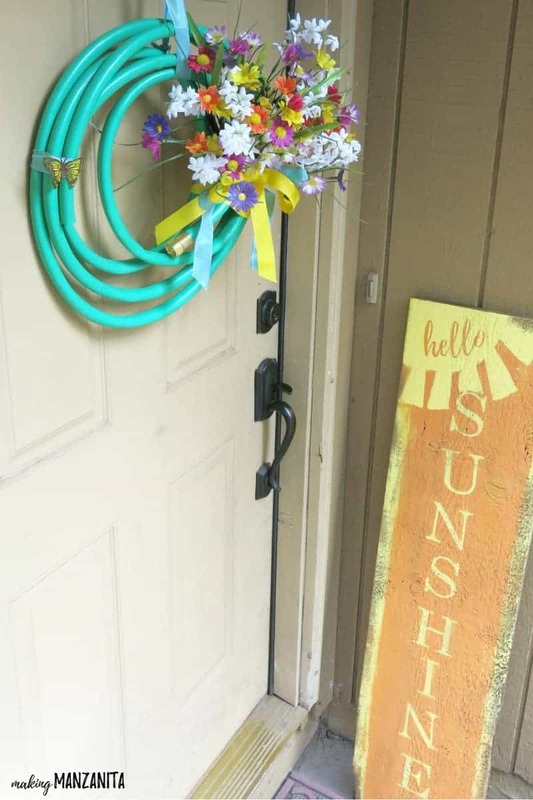 This summer wreath made out of a garden hose was made for the monthly challenge that I am thrilled to be apart of – the Thrift Store Upcycle group. If you caught me on Hometalk’s Facebook page with a LIVE video on Sunday, you saw me make this and my Hello Sunshine wood sign. You can find the video at the bottom of this post! This summer wreath post contains affiliate links, but nothing that I wouldn’t wholeheartedly recommend anyway! Read my full disclosure here. Are you ready to see this Summer wreath tutorial?? Step 1. 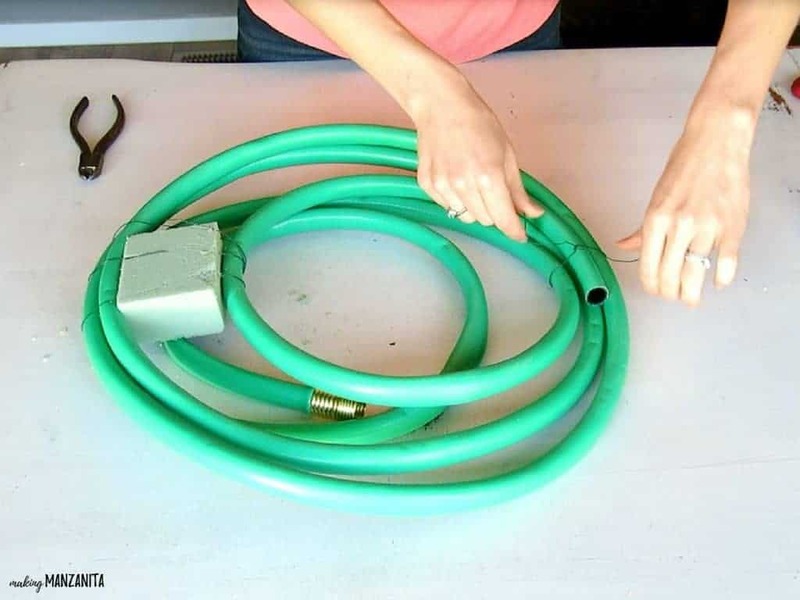 Attach foam block to garden hose. 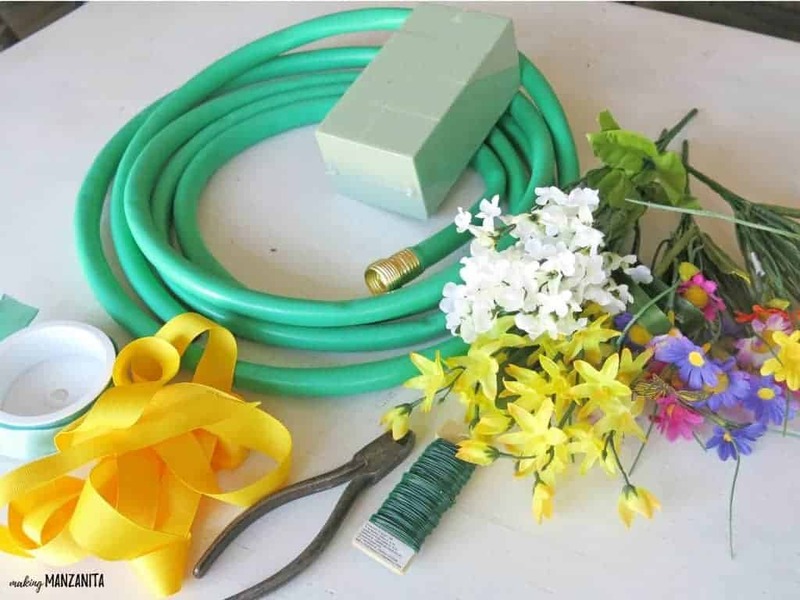 The first step to creating this summer wreath is to attach the foam block to the garden hose. The foam block I used was approximately 3.5” x 3” x 2”. 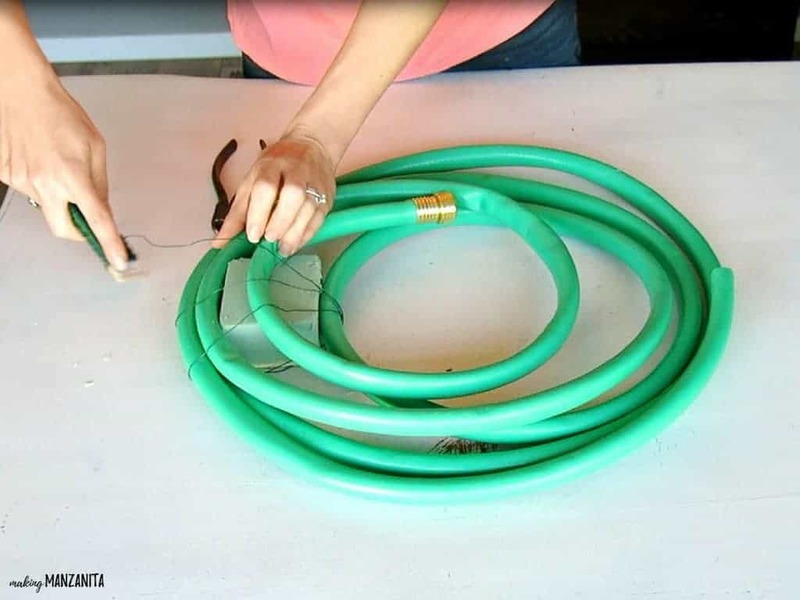 I coiled the garden hose into a circle shape and then maneuvered the hose around the block so it could lay flat. Once you have it arranged right, you can wrap and tighten the floral wire around a few times to keep everything in place. 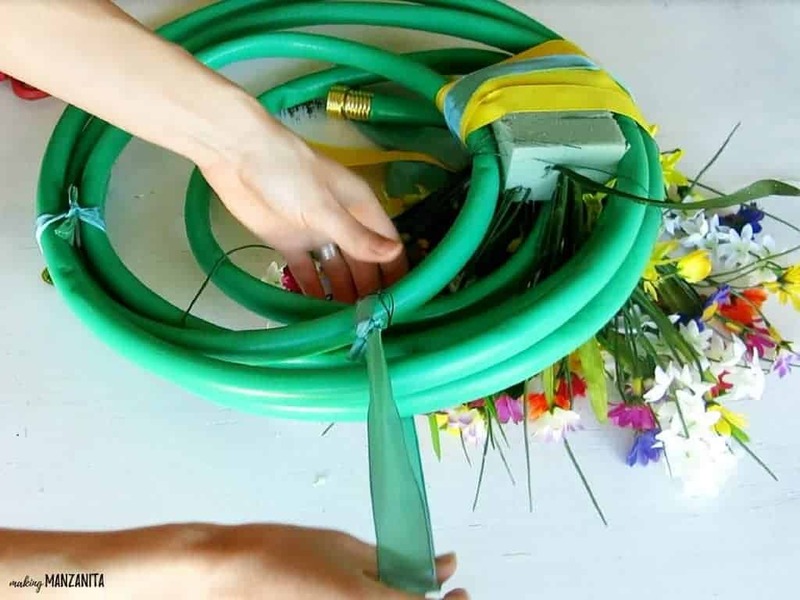 Quick tip: If you’ve got a wild hose and having trouble getting your hose into a wreath shape, you can secure it in a few different spots with zip ties. Step 2. 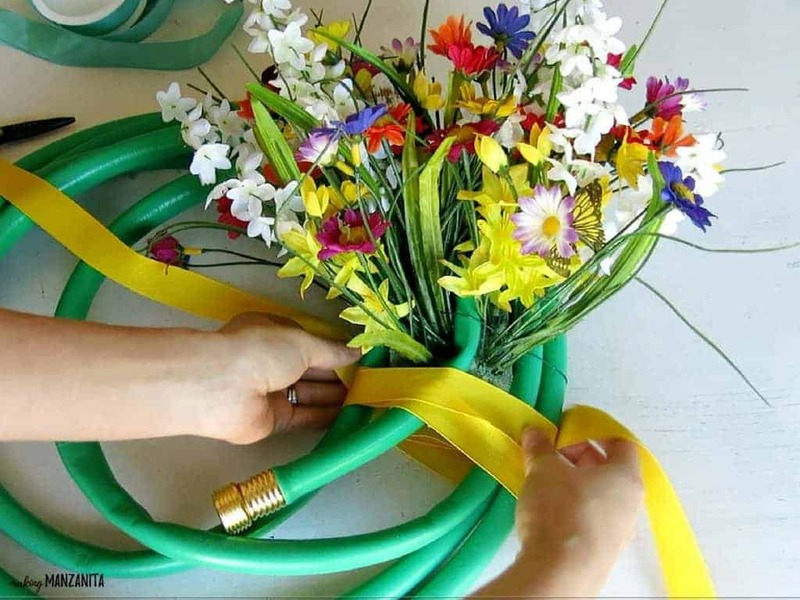 Secure the opposite side of the hose with floral wire. I added a little bit of floral wire to secure the side opposite of the floral foam block. I’m not positive that this was necessarily required, but I felt better but adding the little extra bit to secure the garden hose wreath. Step 3. 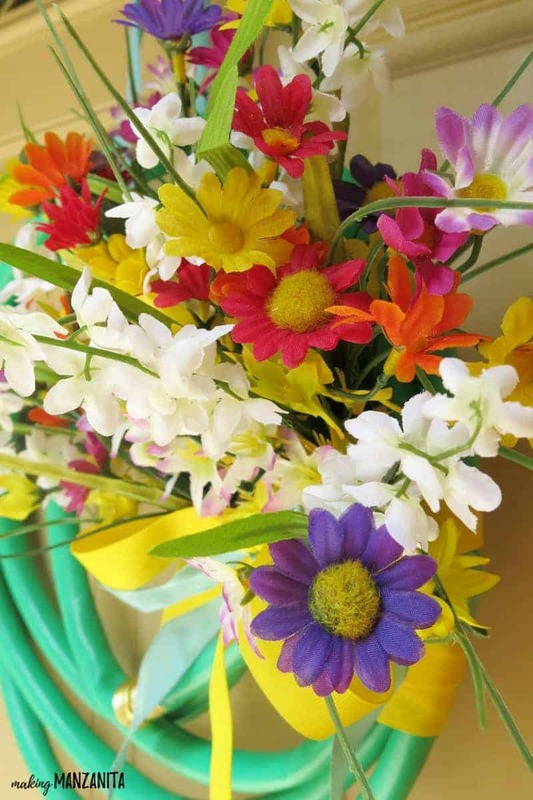 Remove flowers from stems. 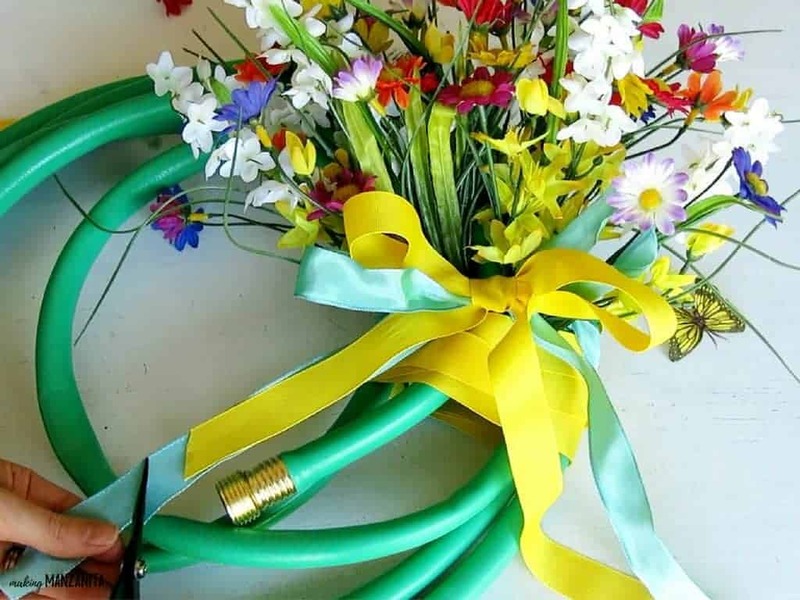 Using wire cutters, you will snip the flowers from the stems. Leave about 3 to 6 inches of stem behind the flower (at various lengths), which you’ll be sticking into the floral foam block. The flowers you purchase may be more or less full than the ones I used. I ended up needing about 4 full floral stems taken apart. Mine were purchased from Dollar Tree and Michael’s. Step 4. Add flowers to foam block. This is the fun part, where the summer wreath starts coming together and takin’ its shape! Start adding in the flowers into the foam block. Keep them pointed upwards and then fanning out from the foam block. Continue adding in the flowers to the floral foam block, filling in all of the spaces on the block. Don’t forget about the edges and the top of the foam block. Step 5. Tie ribbon around the bottom of the foam block. Once you get all the flowers in the block, you’ll be left with the hideous bottom of the block. I was thinking about covering this with moss. I purchased the moss, got the hot glue gun all warmed up and everything and then changed my mind! I am always doing that in the middle of DIYs. I decided to change it up and wrap the yellow ribbon around the garden hose wreath a few times to cover the bottom of the foam block. The yellow ribbon I used to wrap around the block was approximately 100 inches long. Once I covered the block entirely with the yellow ribbon, I added in the blue ribbon for a little extra color. 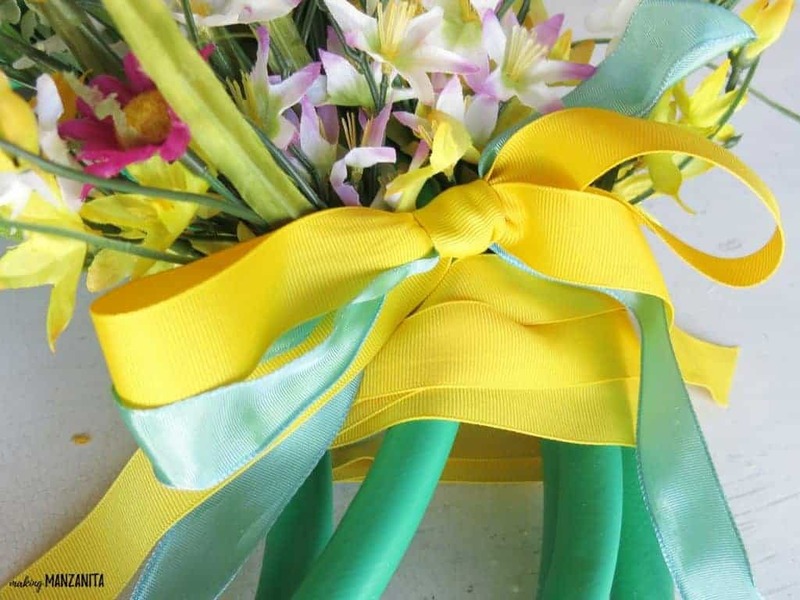 I brought both of the ends of the ribbon up and over a bit of the flowers on each side and then tied a bow. Step 6. Cover wire tie with ribbon. 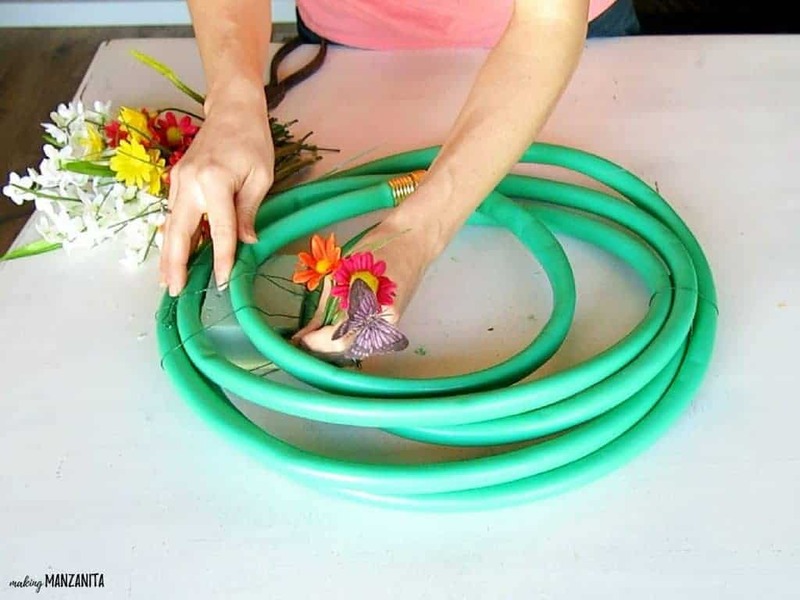 Remember that floral wire we added back in Step 2 to give the garden hose wreath a little more durability? I covered the wire tie with bit of the blue ribbon. Then I glued on that adorable little butterfly that fell off one of the flowers! Step 7. 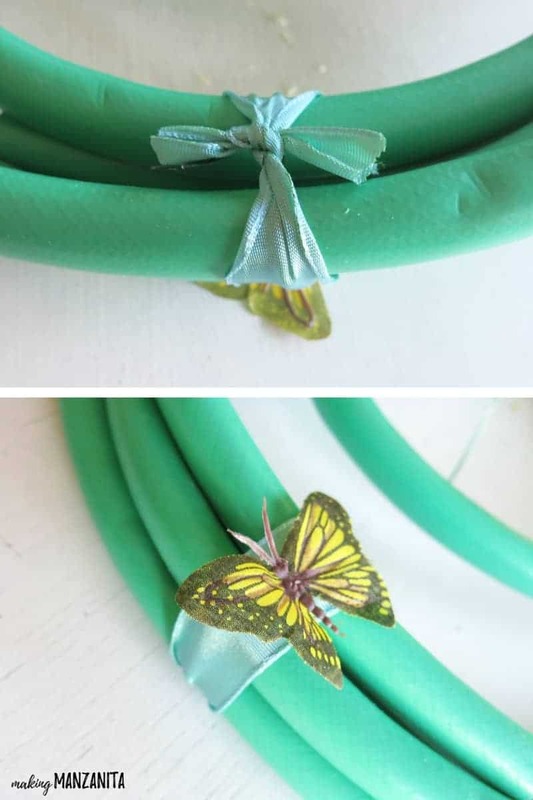 Add ribbon loop to the top of the summer wreath. Lastly, I finished off this summer wreath by tying some ribbon to the top of the wreath as a hanger. 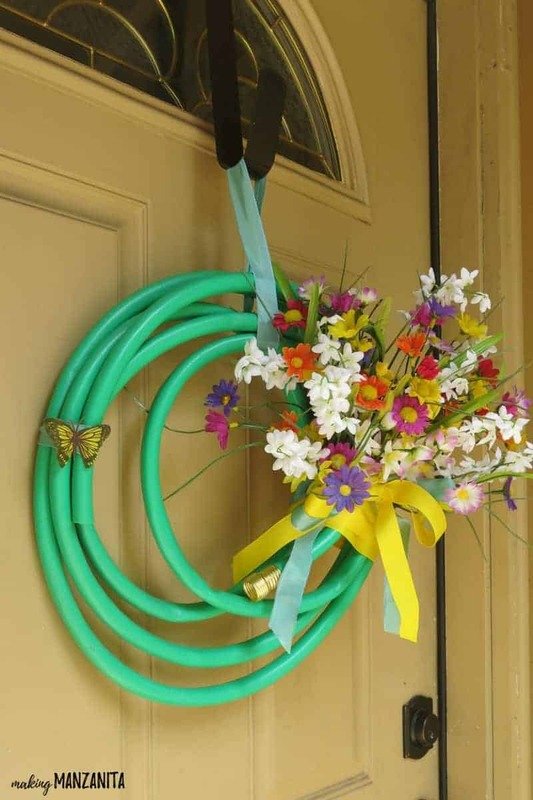 I love the touch of color that the summer wreath made with a garden hose added to my front door. It pairs great with my Hello Sunshine Wood Sign, don’t ya think? It seriously makes me smile every time I walk in the door. I’ll be counting down the days until summer because I can’t wait for BBQs and warm summer nights. How do you decorate your front door for summer? 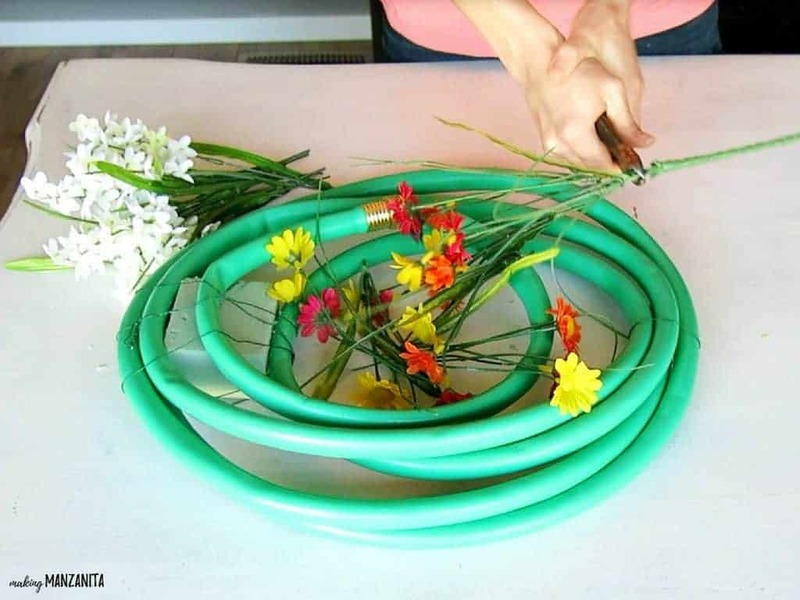 Have you ever made a wreath from a garden house? Here’s a video recap of the LIVE video demo for this and my Hello Sunshine wood sign. What a brilliant idea! So colourful and perfect for the summer season. I think one of these would look great on the privacy fence in my garden! Definitely Maureen! 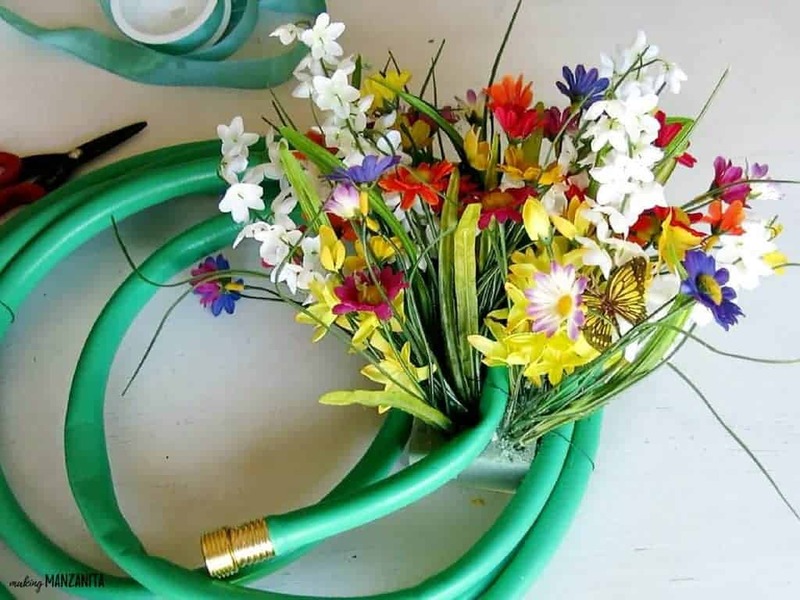 I really like the idea of a garden hose for the garden – makes perfect sense. Such a cute idea! Love alternative wreath ideas like this. Visiting from Thrift Store Challenge. What you did with that hose is Genius! It looks fabulous! Goes to show how most anything can be turned into fabulosity! How adorable. The wreath is so bright and colorful and adds the unexpected. It sure gives your door a pop of color and says come in. The yellow ribbon goes well with your sign and makes the wreath pop too. Love it! Such a nice look for spring and easy to make too. This turned out so great I have often wondered how they were made. So pretty on your door! What a creative upcycle, it look so cool hanging on the door. The yellow ribbon is a great addition. Thanks so much Vicky! I’ve also seen old garden hoses made into door mats using cable ties. There’s almost no going wrong with a great thought, it was so easy!